The Volta–Niger family of languages, also known as West Benue–Congo or East Kwa, is one of the branches of the Niger–Congo language family, with perhaps 50 million speakers. 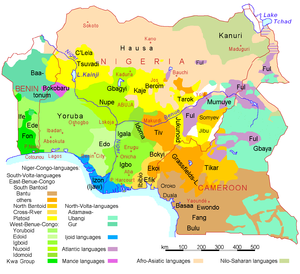 Among these are the most important languages of southern Nigeria, Benin, Togo, and southeast Ghana: Yoruba, Igbo, Bini, Fon, and Ewe. Some important branches of the Volta–Niger and Benue–Congo families are concentrated in Nigeria, Cameroon, and Benin. The Yoruboid languages and Akoko were once linked as the Defoid branch, but more recently they, Edoid, and Igboid have been suggested to be primary branches of an as-yet unnamed group, often abbreviated yeai. Similarly, Oko, Nupoid, and Idomoid are often grouped together under the acronym noi. Ukaan is an Atlantic–Congo language, but it is unclear if it belongs to the Volta–Niger family; Blench suspects it is closer to Benue–Congo.